Perk Up Your Porch with Some Color! With the onset of plummeting temperatures, all of our pretty summer annuals have withered away, leaving our homes’ curb appeal sadly lacking. Between the cloudy gray days and the old brown leaves, it’s time to perk up our porches with some sparkle, fragrant greens and holiday color. Let’s begin the transformation. First, make sure your pots are winter-worthy. Then, there are a few ways to set the scene. For symmetry, set up matching pots either side of the front door. For an asymmetrical look, set a larger pot on one side with two smaller on the other side—this creates a balanced whole. Add in a door embellishment such as a wreath or swag, and possibly small porch-light arrangements or bows. This now creates a picture-perfect entry to welcome your holiday guests. Color is what draws your eye! Pick your theme. Trends this year highlight mixed combinations of gold and platinum. Even on their own, these reflective metals are classic. Copper or bronze easily span the Thanksgiving into New Year’s range of themes. Traditional red and green is always in style. For fun, swap out that traditional pine green for lime accents. Even plum mixed with lime can add a modern pop of color. This week, We’re Focusing on Creating Porch Pots. The basic ingredients for a typical 10” pot consists of a taller center item that might be about 2-3’ in height (or more if a larger pot); at least 3 varieties of greens, about a half to full bundle of each, and your theme items. If your pot needs to be visible from the street, then add items such as sparkling twigs, twinkling lights, glittering bows and bright accents. If you prefer a woodland or natural theme, choose cones, white birch branches, winterberries and other natural offerings. If your pot is viewed from a closer perspective, then consider more detailed embellishments such as outdoor safe ornaments. Greens are the starting material for your pots and should be a mix of tones and textures. You need at least one draping green, several filler greens and an item to add height. There are shades of green, too. Variegated Cedar adds bright lime and golden colors and is a nice,soft draping green. You may also consider Incense Cedar in a medium green with tiny gold tips, while Coned Cedar has bluer foliage and little brown cones. White Pine tips and Port Orford are perfect filler greens. The taller center could be birch logs, a cut spruce top or Redtwig Dogwood branches. Curly willow branches also add wonderful height, texture and color. After choosing your greens, bring out your personality with embellishments. 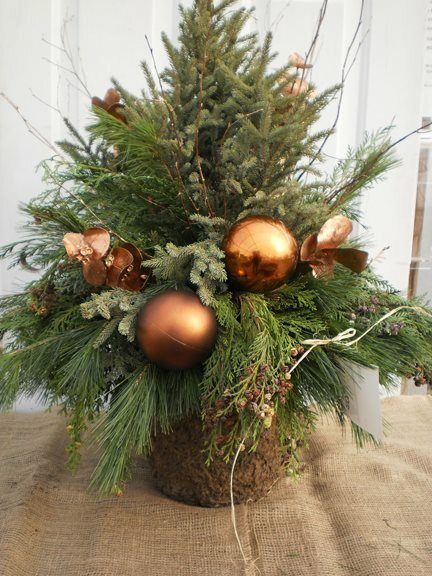 Branches dipped in glitter come in a variety of colors with glittered Pinecones to match. Natural Birch branches, Sugar Cones and Lemon Leaves add simplicity and texture. The ribbon wall spills sparkle, plaids and cheery prints– choose an accent that speaks to you! Branched light sticks (lit with tiny LED lights) add twinkle. If you need help in designing your container, or choosing your ingredients, we’ll be happy to help you! There are basic pots already filled with greens that allow you to just add your personal touch. We can also do it all for you and create custom pots based on your theme and color preferences. Since the forecast looks like we are in for cold and more cold, the soil in your pots might freeze before you’re ready to decorate. We recommend digging out at least half of the soil and holding it in your garage or basement until you’re ready. 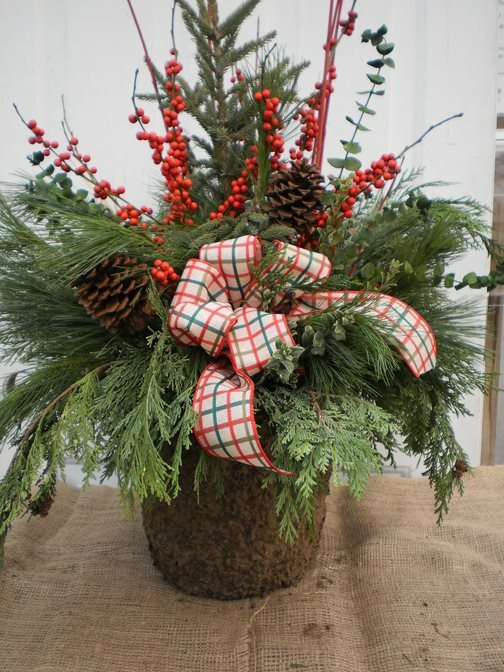 That way you won’t have to fight frozen soil to make your porch festive! You can keep your greens fresh longer by spraying them with WiltPruf®. This waxy spray coats the needles and slows down the evaporation of moisture and drying. If possible, keep your greens out of direct sunlight. Water your pots thoroughly and allow them to freeze to hold in the greens and moisture. 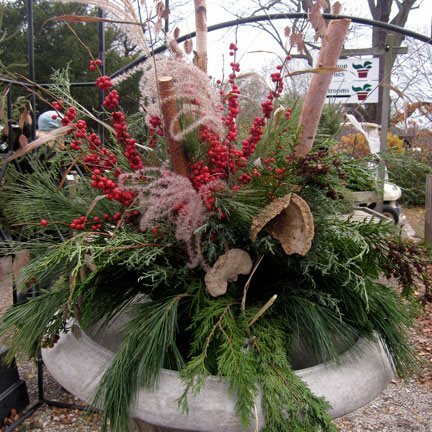 Stay tuned—next week we’ll talk about wreaths and swags, and small green arrangements for porch and post lights.